Seated portrait of Hugh Miller, facing left as viewed, shown reading a book held in his right hand. The sitter’s shoulders are covered in a plaid shawl. Frontispiece to The testimony of the rocks; or, geology in its bearings on the two theologies, natural and revealed by Hugh Miller (Edinburgh, Shepherd & Elliott, 1857). 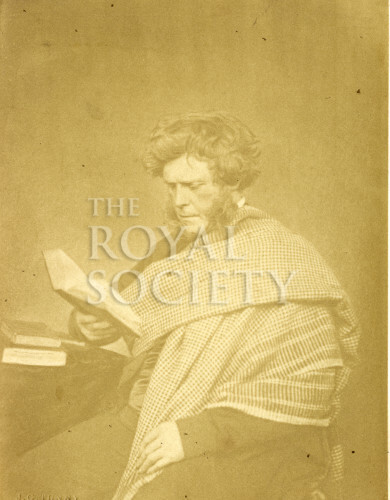 Hugh Miller (1802-1856), Scottish geologist, writer and evangelical was not a Fellow of the Royal Society. He was self-taught, having been apprenticed to a stonemason, and went on to make significant contributions to Scottish geology and palaeontology.